My favourite French beach at Houlgate, Calvados, Normandy. I am sitting wishing I was there again watching the waves amble in (not roll, not crash, just gently amble). When I took this not that long ago it was a lovely warm day with a gentle breeze and a cloudless sky. I can almost hear the sea just looking at this photo. Enjoy! This entry was posted in Uncategorized and tagged Calvados, Houlgate, Normandy, sea, waves. It’s still decidely tropical here in Kent in the UK – I think we are entering the fourth week of our heatwave now. Everyone seems to be suffering in one way or the other. Personally, I am not sleeping well (too hot and sticky) and most of the day I feel quite lethargic (overtired, still hot and sticky). I am struggling to craft much – so my creative ‘me’ time has been mostly absent and I have little to show off here. My New Year plans were to finish more of my knitting WIPs and to use up more of my stash. 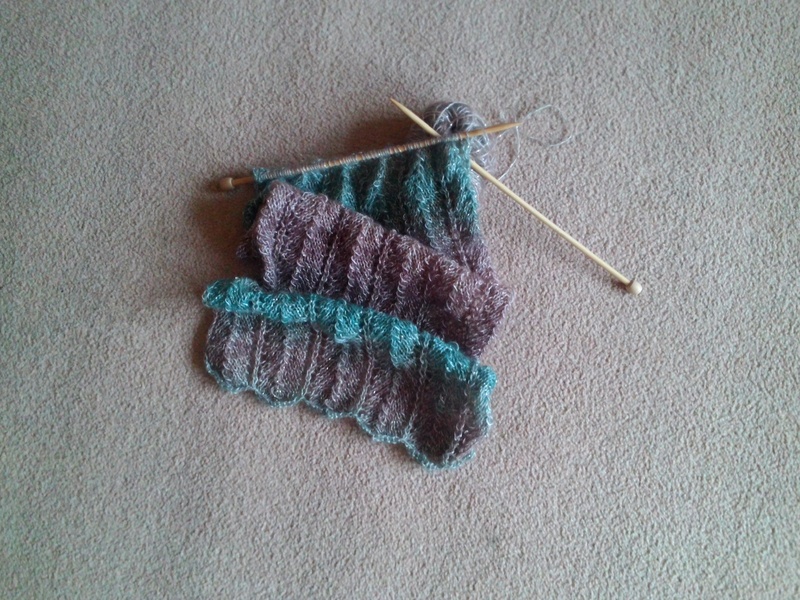 Very slow knitting progress this month. I have a cotton WIP top to finish, hoping to be able to wear it this summer. The pattern was free from Tahki Stacy Charles but I am using Paintbox DK cotton from Loveknitting.com and it will be mostly spearmint green with a little white in the edging. You may think the pattern has been scrumpled a bit! This piece of knitting too – luckily it’s rather forgiving! Hubby thinks I will look like a Pacer sweet packet – does anyone remember those from the 70’s/80’s? They were minty treats, now discontinued, made by the makers of Opal Fruits (now called Starburst). I love a bit of warmth but I prefer it when I am on holiday. With that in my thoughts, perhaps it’s why I recently chose a tropical theme for my hallway decorating. This was done during the first two weeks of the heatwave. Hopefully the next post will have more creative news. Meanwhile I shall enjoy my green day. This entry was posted in Uncategorized and tagged craft, green, Kent, knitting, loveknitting.com, pacers, paintbox dk cotton, tahki stacy charles, tsc. For me, the coast is always an attraction come rain or shine, however in this constant heat it is more so. I fitted in a little seaside trip. A little bit of Hastings consoles my soul, for the vista and also the memories of living here as a child. I often wonder why I ‘landed’ inland and how long I can remain here. What makes us choose the colours we work with? Anyone have stories about just that? This entry was posted in Uncategorized and tagged cliff, Fairlight, Hastings, quilt, Rock a Nore, sea, sew, sky. I recently discovered an enchanting volunteer-run farm in Shooters Hill, South London. It was hosting a small but interesting textile and wool festival. It was a great surprise to discover such a treasure in this built up area and the views from outside the farm are far and wide across to the City, quite clearly you see Canary Wharf and The Shard (Shooters Hill is one of the highest points in London). In years gone by it was a huge pig farm, complete with abattoir and the site has battled over the years against redevelopment. It is a working farm with produce (great jam! ), animals, ponds, facilities for school trips and a lovely cottage garden, namely ‘Peter Rabbit’s Garden’ complete with knitted animals and birds hidden amongst flowers and vegetables. Here are a few pics just to give you a taster of the day. I only wish I’d taken more, not only of the garden but of the festival too. Roll on next year’s one – I will go back! Here you see a scarecrow family outside the farmhouse, Jemima, a green parrot and one of the ponds with fantastic lily pads. A little about the cottage garden too. And one marvellous exhibitor on the day. Wow! Her cloth dolls are amazing! This entry was posted in Uncategorized and tagged knit, london, ray slater, shooters hill, textile, woodlands farm, woodlandsfarmtrust. I have managed to do a little more machine sewing, so the mini pile of blue piecing for a quilt top has grown. I shall pop photos up another day. I hadn’t realised just how many squares I needed to make a cover for a single sized bed so it is a longer project than anticipated but I haven’t ‘redesigned’ it yet and I haven’t decided to make a cushion instead (ie. cheating!). I hope others are crafting more efficiently than me ! RIPPING or FROGGING – undoing a yarn project making ripping or frogging sounds as you do it ! This entry was posted in Uncategorized and tagged cotton, crafting., knit, quilt, stash, yarn. Last week I took a trip to London with a good friend to celebrate both our birthdays (mine, late, hers, early). It was such a glorious day – blue skies, lovely and warm. We decided to include a bit of culture with a visit to The National Gallery. There is no way you can look at everything so we opted to see a few favourite artists’ paintings – namely Monet, Matisse, Van Gogh and Constable. I am always amazed at what different reactions people have when they see art. What some love, others hate and vice versa. There were quiet rooms and others with hordes in front of the ‘popular’ paintings, perhaps missing lesser known ones that are just as wonderful. Tourists aplenty, many with tour headsets, children getting fed up, bohemian types and others like us, casually taking a stroll and admiring the view. No actual photos to share (no photography allowed officially, though I saw many snapping away on camera phones), just my amazement at actually seeing The Hay Wain by Constable and Sunflowers by Van Gogh in reality. My friend’s words at reaching the Van Gogh were ‘oh my goodness, I think I might pee myself! Is it really it? I can’t believe I am standing in front of it!’, with tears in her eyes. Enjoyment in many different forms, eh? There was some excitement whilst we sat. A swarm of bees suddenly appeared from nowhere,they weren’t attacking, they were seemingly looking for something else, perhaps an errant Queen Bee. Someone knew there were beekeepers visiting the hives on the roof of the nearby National Gallery so they were summoned to see if they could encourage the bees to move on. Unfortunately they had moved on by then by themselves but it’s not everyday you see a beekeeper in full garb in the middle of London, around the corner from Trafalgar Square, opposite Charing Cross Station! What a great idea, hives on roofs, honey to be sold in the Gallery shop, and how opportune that they were being checked right that moment. So this was the start of my day – all before the planned Afternoon Tea which was the birthday(s) celebration. We ate scones and jam, cakes and drank champagne. Sometimes it’s great to be another year older! This entry was posted in Uncategorized and tagged beekeeper, charing cross, East Window, hives, honey, shirazeh houshiary, st martins in the field, trafalgar square. Remedies on a summer’s day .. Golden Tea or Gin? We’re having a mega heatwave here in the UK. It’s already been a very hot couple of weeks. I’ve been dipping in and out of the sunshine, enjoying it in short bursts and making sure to keep cool and chilled otherwise. The extreme weather brings it’s own problems – dry gardens, low watering holes, etc but it causes many others – heatstroke, sleepless nights and so on. There has also been a really high pollen count playing havoc for hayfever sufferers, me included. My own version is milk, fresh ginger, turmeric, ground cinnamon, warmed, strained, sweetened with agave syrup. On a little visit to a nearby town, Westerham, someone else has another summer ‘remedy’ to another ‘problem’ – this made me laugh out loud! Im not a gin fan but I love a sense of humour! This entry was posted in Uncategorized and tagged hayfever, turmeric, westerham.